A man’s full life is said to be 120years. In this long journey through life, several stages are celebrated as auspicious and Shantikarya is carried out. The mid-point is at sixty years. 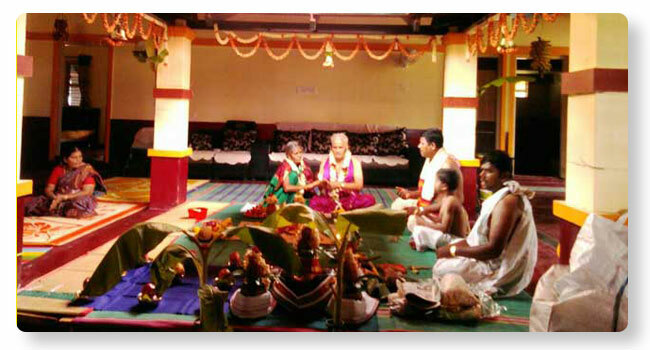 When anyone reaches this age, Ugraratha Shanti is performed. It is said that Yamadharma comes riding in a chariot called Ugraratha at this juncture. During this Sandhikala, on the day of birthstar, homas, Japas and Pujas are carried out to bless the Jatak. On this occasion, all the gods of sixty Samvatsaras, stars, Chiranjeevis, Kuladevata, Ishtadevata, seven seas, seven sacred rivers, Dwadasha Rudras and Dwadasha Adityas are offered Puja and venerated for their blessings.